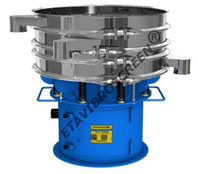 Eta Vibro Screen®s are used for Removing Dust, Chips & such Fine Impurities from Plastic Materials being Reprocessed or recycled specially in Injection Molding/Scrap Grinding Process. It can also be used for recovering good Granules from floor sweepings. Polymer Powder/ Pvc Screener:Eta Vibro Screen®s are used for sieving of Polymer powder like PVC resin or compound, LLDPE Powder, PP Powder, Lamination Powder etc. PVS Compound needs to be screened after cooler/mixer to remove lumps, unmixed material and foreign material. Eta Vibro Screen® can be used online and offline. Master Batch / Filler Compound Classifier is used for Removing Lumps or Long Strands and Chips, Dusting or Undercut in Extrusion. This machine is very useful in industries like Master Batch, Filler Compound, Extruded Granules. The machine in Two Screen Construction known as Classifier is used to do Product Quality Control by ensuring that outgoing product is Not Too Large or Too Small. The larger pieces are retained above the first Screen and dusting chips/off cuts fall down below the lower screen thus giving main product from middle grade. 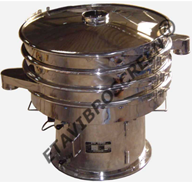 ETA Powder Product Sifter is used for screening /sifting of Bulk Chemical/Fine chemicals/ Specialty Additives like Soda Ash, Soda-Bi-Carb, Maleic acid, Carbon and activated carbon powder, Toner Powder, Graphite, Stearic acid etc. Eta Vibro Screen®s are used for Screening & Filtering Toner Powder New or Recycled- for Refilling, Recycling or Repacking from Bulk Packs or Sweeping Waste to Remove Paper Pieces, Staple Pins Etc. 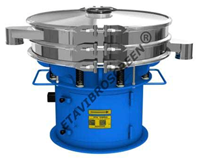 Eta Vibro Screen®s are used for Removal Of Dusting From Pesticide and Insecticide Noodles and other chemicals which have to be in granular form. Vibro Screens are also used for removing lumps or large pieces and foreign material from product. In manufacturing process of Pesticides and insecticides granules, dusting is generated. Eta Pesticides Granules Screener when installed after the extrusion process significantly reduces amount of dusting in pesticides granules. This not only makes the product better but also reduces the harmful effect of dust spreading in air.Similarly for zinc oxide, metal carbide, sintering processes such De Dusting machine is very useful. 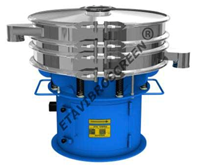 Eta Vibro Screen® are used for Screening-Removing Lumps & Foreign Material from products like Dyes & Pigments, Intermediates, Additives, Food Colours & Food Ingredients, Fine Chemicals etc. before processing or packing the products specially for exports. Eta tobacco grader is used for grading tobacco leaves into different grades and ensure proper product quality. ETA Tea Grader is used for grading of Tea leaves into different sizes to ensure proper product quality, flavor & taste. Guar Gum Powder Screener is used to screen Guar Gum Powder to remove lumps and foreign material from the powder and also to get the powder of required particle size by screening thru specified mesh. Accurate powder size ensures customer specifications and better price realization in market. ETA Psyllium Husk Grader is used for grading Psyllium( Isabgol) Husk into different sizes. By using different sizes of Mesh, required product quality can be achieved. 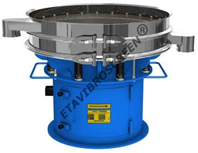 Eta Vibro Screen® is used for screening of Metal Powders and Mineral powders. CI Powder Screener:ETA CI Powder Screener is used to screen CI powder thru specified mesh to get powder of required particle size. The machine is available in different size as per requirement. Sinter Powder Screener:ETA Sinter powder screener is used to remove lumps, oversize and foreign material from sinter powder like Copper, Brass, Aluminium, Bronze. Zinc Powder Screener:Zinc Powder Screener is used to screen zinc powder thru specified mesh. The machine is available in different size as per the requirement. Refractories & Abrasive Powder Grader:ETA Mineral Powder Grader is used for grading Mineral Powder as per the size. The machine is used for grading of Refractories and abrasive. Mineral Powder Screener:ETA Mineral Powder Screener is used to screen mineral powder. The material is screened thru specified mesh to get required product size. The machine is used for Lime Stone Powder, Soap Stone Powder, ball clay, china clay, dolomite, Mica, Graphite, Quartz, Carbon Powder etc. Eta Vibro Screen®s are used for fiber recovery from wash water, to remove fine fiber from recycled or back water and to reduce nozzle chocking. Eta Vibro Screen®s are used in paper mill kitchen for filtering coating solutions using fine mesh. Paper mill produces huge volume of effluent which contains very low percentage of paper fibre. This causes heavy load of solids on ETP hence filtering fibers from ETP stream is very useful for efficient functioning of ETP by reducing solid sludge and recovering useful fiber. 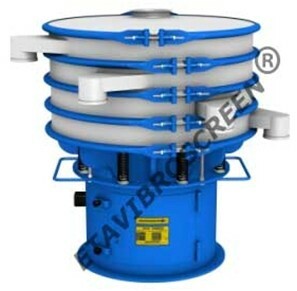 Pharmaceutical Industry needs sifting of pharma powder at every stage. Eta Pharma sifter is used for this purpose. Although our machines are different in design and construction as compared to conventional sifter, they are much more reliable and efficient as compared to conventional mechanical sifter. Eta Pharma sifter are also far better in reliability and maintenance then gyro sifter offered by pharmaceutical machinery manufacturers. ETA Herbal Powder screener is used to screen herbal powder like ashvagandh powder, sudarshan powder, harde powder etc.The machine removes foreign material, fibres and unground materials, pieces etc. from the product. ETA Herbal Syrup Filter is used to filter Herbal Syrup like Aradusy syrup, Ashwagandha syrup, Sankhpushpy syrup, herbal oil etc.. The machine removes foreign material, pieces etc. from the product. ETA Catalyst Screener and Grader is used for grading catalyst balls/packings into different sizes and removing powder/dust from the same. It can also be used for screening catalyst powder. The machine is very useful to maintenance contractors in fertilizer/petrochemicals plants and/or refineries. ETA Casting Sand Screener is used to remove lumps, foreign material and impurities from used casting sand (green sand) before reusing it.It is also useful for screening zircon sand. 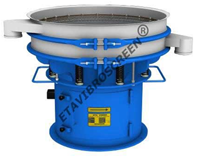 Eta Vibro Screen®s are used for Classifying Mixed Shots or Removing Fused Shots and Dust/Fines from Used shots, in Shot Peening and Shot Blasting Process. It can be used for similar purpose in Sand Blasting also. The machine can be placed On Line for continuous operation or can be Off Line for Intermittent working. Refractory and Abrasives industry always need precisely classified raw material. Their end product is also defined by the grain or grit size of the material used. Eta Vibro Screen®, in multi deck construction, gives precise classification due to its perfect motion control. Special features like support mesh etc. are built in to minimize the wire mesh wear and tear in this application. Ceramic industry needs screening for variety of raw materials and in-process material. Most of the ceramic industries have huge volume of liquid slurry to be filtered on line for which ETA Vibro screen proves to be the most reliable equipment. Slurry is fed continuously on screen where grit or oversize material is continuously removed from the screen the filtered slurry goes for the next process. Eta Vibro Screen® offers to be trouble free solution for the duty with specialized modification to handle the tough application. Starch and Dextrose industry is having multiple applications for Eta Vibro Screen®. All the departments of this industry need one or the other kind of separation in solid and liquid phase. 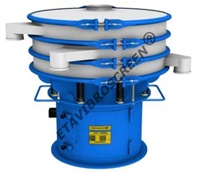 Eta Vibro Screen®s are used for filtration of starch milk, filtration of starch slurry, screening of starch powder, Gluten and many other derivatives and by products of starch plants. Eta Vibro Screen®s are used in Dairy industry as milk powder sifters or Dry Fruit/ caramel screener. Milk powder produced in a drier is hygroscopic in nature due to which it forms lumps. So Eta Vibro Screen® is installed immediately after drier to sift or break the soft lumps of milk powder. Caramel and dry pieces used by ice-cream industry are also screened by Eta Vibro Screen®. In manufacturing process of Pesticides and insecticides granules, dusting is generated. Eta Pesticides Granules Screener when installed after the extrusion process significantly reduces amount of dusting in pesticides granules. This not only makes the product better but also reduces the harm full effect of dust spreading in air. Similarly for zinc oxide, metal carbide, sintering processes such De Dusting machine is very useful. Soap and Detergent industry has been using conventional rectangle screens so far. 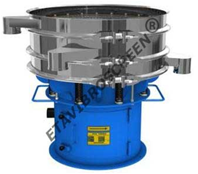 ETA Vibro Screened offers distinct advantage of compact and trouble free design for duties like screening of Soda Ash powder as well as finished detergent powder. In both cases Eta Vibro Screen® performs the function of removal of oversize material, unmixed material or moist lumps. Bakery, Foundry, Fisheries, Rotomoulding etc. Eta Vibro Screen® is very versatile machine. It can be used in many industries. BUSINESS AREAS given in above list are prime areas in which our machine is widely used. But even if your industry does not fall in any above mentioned areas still you can contact us and get trial with your material.